UN Deputy Secretary-General Amina Mohammed (2nd from right) stands with (to her right) Margot Wallström, Minister for Foreign Affairs of Sweden; & Bineta Diop, AU Special Envoy for Women, Peace & Security, at the National Fistula Centre in Niamey, Niger. Women across Africa’s Sahel region can be agents for a “new paradigm” for peacebuilding and development that benefits all people there, the United Nations Security Council heard on Tuesday. 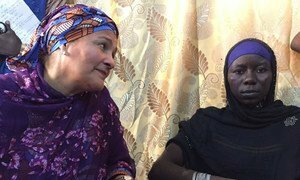 Making the case was UN Deputy Secretary-General Amina Mohammed, fresh from a mission to South Sudan, Chad and Niger; all countries where women and children are paying what she called the “stark cost” of conflict. “With today’s conflicts greater in both number and complexity, it is more important than ever to find the path to peacebuilding and sustainable development for all,” she told the Council. The joint UN-African Union (AU) delegation to the Sahel was comprised of senior leaders from the international community, mostly women. For Bineta Diop, the AU Special Envoy for Women, Peace and Security, the mission highlighted the “heart-rending and poignant realities” of women and girls in places such as the Lake Chad Basin region, where the activities of the militant group Boko Haram have displaced millions. While the delegation met women terrorized by the extremists, or who had been married off while still girls, they encountered others who had stepped in to maintain livelihoods in the absence of men, as well as women religious leaders who are working to end child marriage and prevent radicalization via extremist ideology. Nearly two decades ago, the UN Security Council adopted a landmark resolution that has placed the issue of women, peace and security on the global agenda. Resolution 1325 (2000) turns 20 in two years’ time and Sweden’s Foreign Minister issued a challenge to the international community to mark the anniversary. Margot Wallström called on the Council to ensure UN peacekeeping and political missions fully deliver on its promises. This, she said, will include making sure women are at the negotiation table, and that mission mandates include a perspective relating to women, peace and security, among other points. “Missions like the one undertaken last week should become annual events, and every Security Council meeting should consider the women, peace and security perspective as an essential part of our work to end conflicts,” she said. Twenty-three-year-old Kodi Moumdau laughs with a group of young women in brightly coloured shawls in her ward at the National Fistula Centre [Centre National de Référence de Fistule Obstétricale] in the outskirts of Niamey, the capital of Niger. 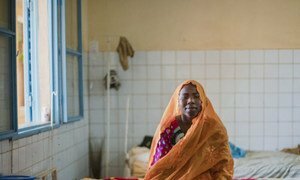 They can consider themselves amongst the lucky women who have been treated for and survived an obstetric fistula condition.